What is CT SCAN (Computer Tomography Scan)? CT, or CAT scans, are special X-ray tests that produce cross-sectional images of the body using X-rays and a computer. 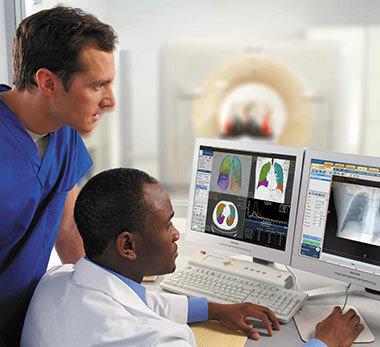 CT scans are also referred to as computerized axial tomography. CT was developed independently by a British engineer named Sir Godfrey Hounsfield and Dr. Alan Cormack. It has become a mainstay for diagnosing medical diseases. For their work, Hounsfield and Cormack were jointly awarded the Nobel Prize in 1979. CT scanners first began to be installed in 1974. CT scanners have vastly improved patient comfort because a scan can be done quickly. Improvements have led to higher-resolution images, which assist the doctor in making a diagnosis. For example, the CT scan can help doctors to visualize small nodules or tumors, which they cannot see with a plain film X-ray. CT scan images allow the doctor to look at the inside of the body just as one would look at the inside of a loaf of bread by slicing it. This type of special X-ray, in a sense, takes "pictures" of slices of the body so doctors can look right at the area of interest. CT scans are frequently used to evaluate the brain, neck, spine, chest, abdomen, pelvis, and sinuses. Scanners are found not only in hospital X-ray departments, but also in outpatient offices. CT has revolutionized medicine because it allows doctors to see diseases that, in the past, could often only be found at surgery or atautopsy. CT is noninvasive, safe, and well-tolerated. It provides a highly detailed look at many different parts of the body. If one looks at a standard X-ray image or radiograph (such as a chest X-ray), it appears as if they are looking through the body. CT and MRI are similar to each other, but provide a much different view of the body than an X-ray does. CT and MRI produce cross-sectional images that appear to open the body up, allowing the doctor to look at it from the inside. MRI uses a magnetic field and radio waves to produce images, while CT uses X-rays to produce images. Plain X-rays are an inexpensive, quick test and are accurate at diagnosing things such as pneumonia, arthritis, and fractures. 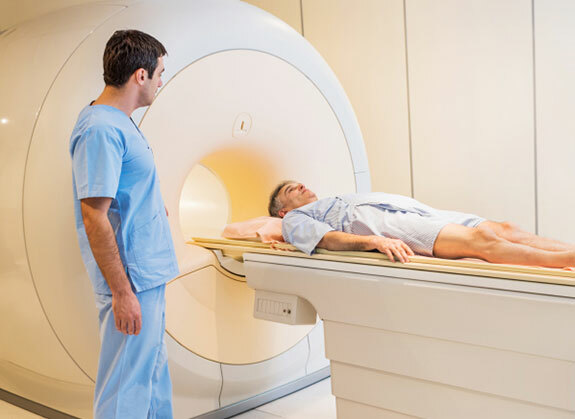 CT and MRI better to evaluate soft tissues such as the brain, liver, and abdominal organs, as well as to visualize subtle abnormalities that may not be apparent on regular X-ray tests. People often have CT scans to further evaluate an abnormality seen on another test such as an X-ray or an ultrasound. They may also have a CT to check for specific symptoms such as pain or dizziness. People with cancer may have a CT to evaluate the spread of disease. 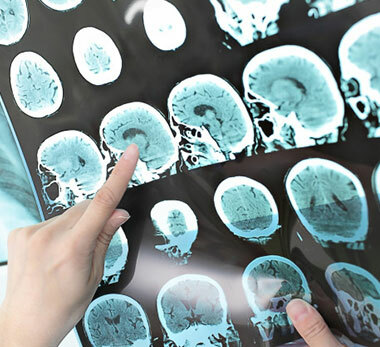 A head or brain CT is used to evaluate the various structures of the brain to look for a mass, stroke, area of bleeding, or blood vessel abnormality. It is also sometimes used to look at the skull. A neck CT checks the soft tissues of the neck and is frequently used to study a lump or mass in the neck or to look for enlarged lymph nodesor glands. CT of the chest is frequently used to further study an abnormality on a plain chest X-ray. It is also often used to look for enlarged lymph nodes. Abdominal and pelvic CT looks at the abdominal and pelvic organs (such as the liver, spleen, kidneys, pancreas, and adrenal glands) and thegastrointestinal tract. These studies are often ordered to check for a cause of pain and sometimes to follow up on an abnormality seen on another test such as an ultrasound. A sinus CT exam is used to both diagnose sinus disease and to detect a narrowing or obstruction in the sinus drainage pathway. A spine CT test is most commonly used to detect a herniated disc or narrowing of the spinal canal (spinal stenosis) in people with neck, arm, back, and/or leg pain. It is also used to detect a fracture or break in the spine.